The Olympics are coming up soon. 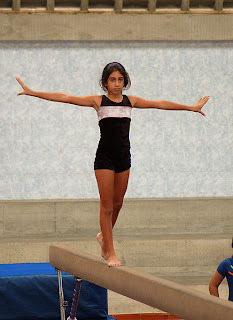 One of my favorite events is the Gymnastics competition. As a little girl, I would watch the gymnasts flip and twirl and long to be like them. Now, all of these years later, I still enjoy watching them. The balance beam is especially interesting to me, as they do all of the flips and twirls on a bar that is about 4 inches wide. It is critical that they maintain balance or they will fall off. Sometimes, I feel a bit like the gymnast on the balance beam in my life. Only I am holding several weights in each arm. Weights like husband, kids, cleaning, cooking, laundry, part-time job, and church. Way up on the tippy top I might add a small, 1 lb weight called friends or hobby. The problem is I have an awfully hard time staying on the balance beam. It seems that if I put my focus on one particular weight it throws me off balance and I fall off. Through the years, this has probably been one of my main challenges. If I give a lot of time and effort to my home, then I don't spend as much time with the kids as I should. If I give lots of effort to my job outside the home, then my home suffers. If I spend too much time with my kids, then my husband feels neglected. One of the most important things we can do as moms is try to balance everything the best we can. I have found that one of the best ways to do that for me is to stand back and evaluate what is truly important at the moment. This past spring, this was especially critical for me to do. We have a landscaping business and one of our secretaries quit. It was necessary for me to step up and fill her position. Given that it was springtime, I am usually pretty busy, anyway, so it threw me into working full-time hours. I had to make some decisions: What was most important at home? What had to be done immediately and what could wait? Was it more important to attend my daughter's soccer game or to clean that messy closet? 1. Keep people first, when it is possible. If I am choosing between my husband or a load of laundry, I choose my husband. When it is my child's game or a messy house, I choose the game. 2. Arrange our hours wisely. Over the years, I have realized that my most productive time is in the morning and so I will try to do high-energy tasks at this time (cleaning the mud room, scrubbing floors, gardening). I lose more and more energy as the day goes by and so I save things like folding laundry and bookkeeping for the end of the day, when I don't need as much energy. Everyone is different, but it helps to look at your energy level and then adjust your tasks accordingly. 3. Realize the work's not going anywhere. This is probably one of the most important things for me to realize. I used to get all stressed out and uptight, but gradually I realized that I just had to prioritize my list each day and know that whatever doesn't get done will still be there tomorrow. 4. Stop procrastinating! Okay, so I still struggle with this one a bit. Gradually, I am realizing that the drawer that is driving me crazy will only take 15 minutes to organize. The closet will take an hour or two. I often look at projects like that and think I need at least a day to accomplish them, but inevitably, they take less time than I was anticipating and it is rarely as bad as I thought it would be. 5. Use your 15 minutes between commitments wisely. When I have days that are all broken up with appointments or commitments, I find that I can fit a lot of work in between if I just use my time wisely, instead of figuring the day is shot and just wasting time in between. 6. Now, with all of that said, I do want to mention that I do think it is important to make sure that you do have that weight of friends or hobby thrown in on the top. These are fun and refreshing ways to renew our energy and help us give our best to our family without getting burnt out, if we keep them prioritized properly and in such a way that we do not hurt or neglect our family (our most important calling) in the process. I hope these hints are helpful to you, as you try to carefully stay on the balance beam. It is no easy task, but it is oh, so rewarding! There is nothing better in life than being a wife, mom, and homemaker. I wouldn't trade it for the world! I've got some re-balancing to do myself, so thank you for this post. Having just gotten back from a 12-day vacation I'm having a hard time getting back into the swing of things. Thanks for the motivation! Hope you had a great time away! Vacation throws me off, too :) We are leaving this Friday for a week away, and while I am so excited to go, it does mess with my routine and balance!